They're done! 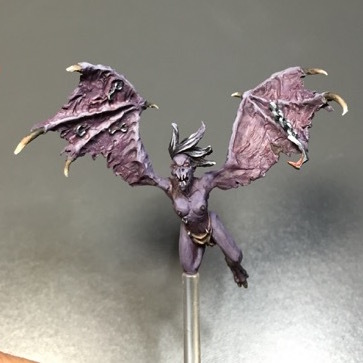 I completed the five Harpies of the Apocalypse and learned how to mount miniature on clear, acrylic posts and use blood effects. The white in the hair was a final touch to add some wacky, Cruella De Vil-style interest to their undoubtedly greasy mops. I also used Tamiya Color Clear Red for the blood effects– my first time using it! I've never painted anything that needed gore before, and I was very careful not to make a mess of it. It's flammable, toxic, and it'll burn your nostrils if you get a whiff of it. It's strong! I used one of those manicure sticks to dip into the little pot, spread some on my wet pallete, and slowly applied it to the miniatures in a dabbing motion. Two of the harpies have, um, souvenirs– one has a severed hand attached to the inside of her wing. The other harpy clutches a man's severed head in her left foot talons. (Gross!) I figured this called for some blood since harpies are nasty creatures who would most certainly hoard severed body parts as a type of status symbol in their... flock? What do you call a group of harpies? If a group of crows is called a murder and a gang of witches is called a coven, then a group of harpies should most certainly have a name equally as ominous. On a related note, shipping these off to their new owner is going to be fun! They're precariously perched atop these clear rods and I want to make sure they arrive still attached to them. 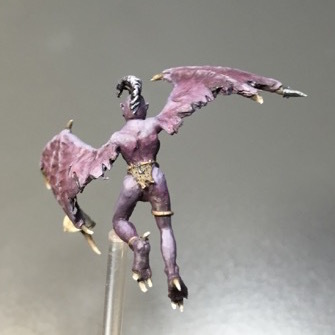 Affixing them to the thin plastic poles was difficult, since the glue took awhile to set and I wanted each harpy at an interesting angle of flight. Each one is glued around their kneecap and I don't trust a shipping box not to get jostled. I'll definitely envelop them in some padding before sending them off to face the dangers of their United States Postal Service adventure (though I trust they'll be in good hands). I shipped off Obi-wan Shinobi the week before last and it ended up being $24 for Ground Shipping halfway across the U.S. after going to one of those The UPS Store locations. I've never sent a commission in the mail that far before (about 2,000 miles away) and I'd prefer to send it Priority Mail in the future (less days being jostled around). I'm looking into new options through USPS and finding out how to print my own shipping labels. I'm sure people who are eBay sellers deal with this all the time, though I want to make sure I'm considering all options so I don't have to charge someone a high rate of shipping for something that weighs about as much as a pencil. I know after a little bit of homework, I'll find something that's reasonably priced and safe for delicate miniatures. Once I get that sorted out, I'll feel much better about shipping off commissions. It's all a learning process, you know! I'm just waiting on my Testors Dull Cote to arrive in the mail. I ordered it on Amazon Prime for about $6.71 and it should be here Wednesday. I need to remember to seal my minis before sending them off (and cover the clear plastic with masking tape first). I wouldn't normally seal miniatures for display, but I don't want to risk them getting chipped or have some of the paint rub off from sheer friction and I hear Testors Dull Cote really is the best stuff for a nice matte finish. We'll see! 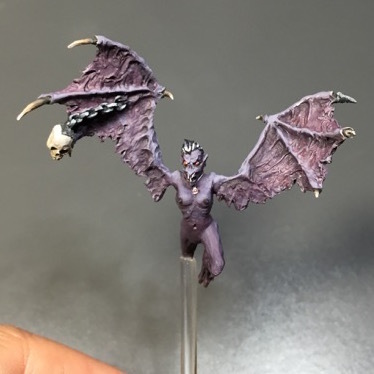 I may even get bored and apply some rust weathering to the chains on two of these harpy hoodlums before sealing them. [update] I grabbed a Super Dungeon Explore chibi since I only have a little while to paint before I need to retire for the evening. 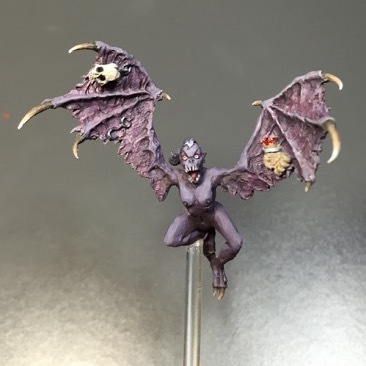 She's part of the Stilt Town Zombies Warband Box expansion and I received her when I took the How to Paint Chibis class at LVO last month taught by Elizabeth (a.k.a. "Miniature Mistress"). I worked in smooth blended highlights in her face and chest as well as gave her a little grimace. She's about to fight for her life and I'm going for an anxious "Why'd it have to be zombies?!" expression. I'm blocking out color in her dual-wielded culinary weaponry (love it) and trying to figure out which colors I'd like to paint her dress. I'll leave that for next time. See you next week!